A friend (and faithful follower of MLST) recently requested the recipe for my homemade bread after I posted a picture on FB the other day. 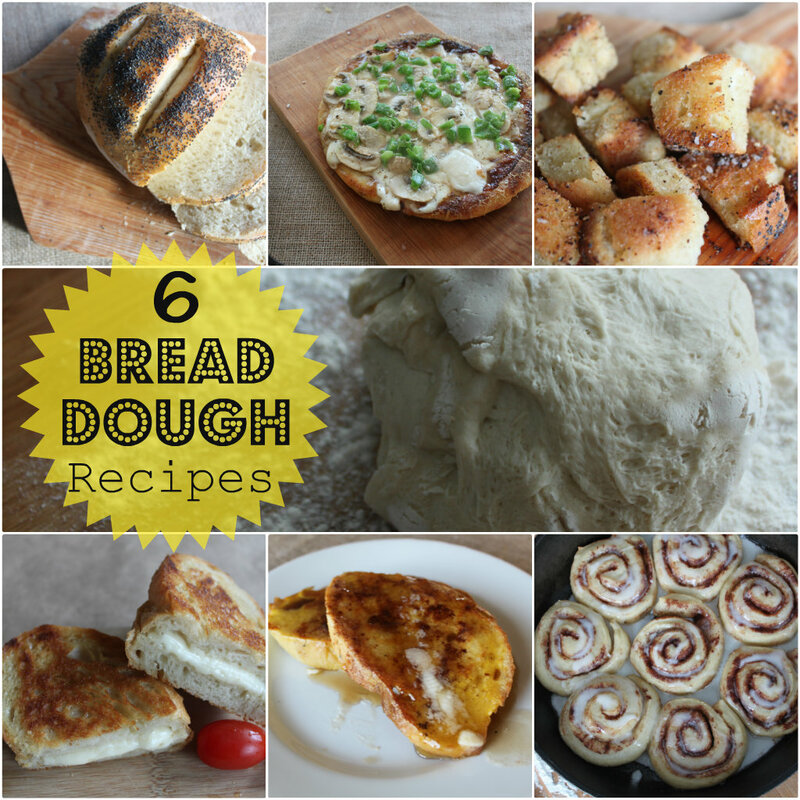 So I decided to share not only the simple recipe for the dough, but also recipes of a variety of yummy goodness that you can make with the dough. (Yes, I made all those things pictured up there...and they are all pretty dang amazing if I may say so myself.) So I'll be posting some individual recipes in the near future for you to try with your new dough recipe. Today's recipe: dough. I was always intimidated when it came to making bread. Although not a quick fix, this is a very simple recipe. My nutritionist friend Marisa taught me how to make this dough. And she knows what she's doing since she's Italian and even has a brick oven in her kitchen (seriously, how cool is that?!). If you're looking to throw together a loaf of bread in an hour or less, this recipe is not for you. But if you want the tastiest, chewiest, crustiest bread around, look no further, I got ya covered. I use King Arthur flour since it's unbleached. Sure, it may cost a bit more than the bleached stuff, but it's much better for you. Dump about half the bag of flour in a bowl, the salt, and the proofed yeast, along with some warmish water (I start with about 2 cups, then add more if/when needed). And get your hands dirty. Oh before you get all messy, have a piece of parchment or wax paper ready. You should be able to tell just by working with it how much water/flour you need. If your dough is too wet, simply add more flour. If it's too crumbly, add more water. Sprinkle flour over your little ball of goodness. Then grab a couple heavy towels (I used two beach towels) and drape over your bowl. And let it set for 1 1/2-2 hours. After the 2 hours, you want to knead it a bit (nothing crazy) by folding over and punching the dough down several times, dust with flour, and cover again. At this point, I coated the bowl with some olive oil. You'll want to do this step (the kneading part) at least twice, so after you cover it up again, wait another 1 1/2-2 hours and do that process again. It's totally worth the wait, people. Your dough should be growing in size every time you go to knead it. When you're ready to make some bread, sprinkle some corn meal on your cookie sheet (I used a Pampered Chef stone), form some loaf-shaped balls of dough, cut some slits in the top, brush an egg wash over them and sprinkle with your favorite toppings (sesame, poppy or leave plain). Bake at 400 degrees for 30 minutes. And that's how you make delicious homemade bread! This bread is good with just about anything: spread with a little butter, with a bowl of hot soup, used with grilled cheese sandwiches, French toast...really the possibilities are endless! Proof yeast for 10 minutes. Pour 1/2 bag of flour in large bowl, along with salt, yeast, and water. Knead dough until incorporated, adding water/flour as needed. Form into a ball, sprinkle with flour, cover with parchment paper and heavy towels. Let set for 1 1/2-2 hours. After that time, remove cover (dough should have risen significantly), punch down and fold over several times, sprinkle with flour and cover again. Do this step 3 or 4 times, depending on how much time you have. The more the better! Preheat oven to 400 degrees. Sprinkle baking sheet with corn meal, form dough into loaf-shapes, brush with an egg wash (just scramble an egg in a small bowl and use a pastry brush to brush it on your loaves), you can add a topping at this point. Bake for 30 minutes. Like I already mentioned, I'll be sharing more of the recipes I've tried with this dough, so stay tuned! I have never in my life been able to work with yeast. Maybe it wasn't active? I may try again on this bread. I have never been successful in making homemade bread. I am going to give this a shot and hopefully will have more success. Thanks for sharing Kat! Just found you thru Liz's www.themustardceilingblog and LOVE IT- the blog (yours and hers). And bread. I've been in the process of learning to make no-mistake dough for YEARS! I've got to try this- right now. Thanks! So glad you found (hopefully) what you're looking for! I think it's a no-mistake dough for sure...it's so delish:) Thanks for stopping by!